What do you think of this picture? Doesn’t it look heavenly? It was unbelievably good. This cake is roughly 8 carbs per piece and it made 10 pieces. I only had it after a meal and still planned my meal to be less than 20 carbs. My glucose levels were never more than 101. I will be making this again but it will not be a daily or even monthly thing. This will be for holiday treats probably. Want to see it close up? This recipe originally came from this website. The only change that I made to it was that I used salted butter and didn’t add the salt in the recipe. 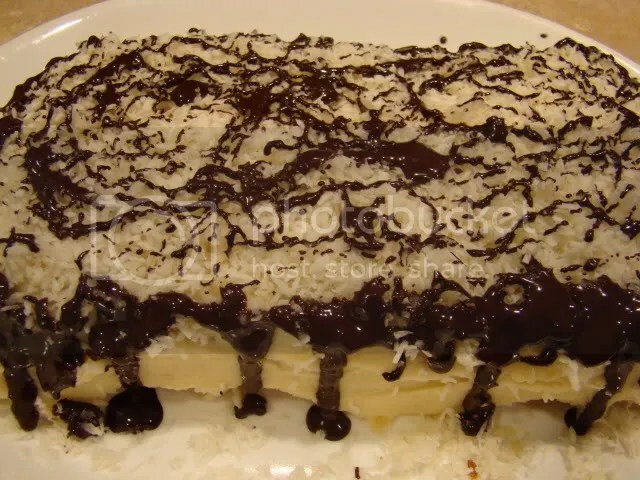 It comes out very dense but once you add the icing, coconut and drizzle with chocolate it is a cake. Trust me on this. I took a piece of this to work with me every day this past week and it was pure heaven in a bowl. Sift the first 2 ingredients into a small bowl; set aside. In a medium bowl, whisk together the remaining ingredients well. Add the dry ingredients and whisk until the batter is smooth with no lumps. It will look a bit like cornbread batter. Spread in a greased 8×4″ loaf pan and bake at 350º for 40 minutes. Remove from the pan and cool on a rack. For the frosting you can find the original recipe here. I changed a couple of things in it to make it taste sweeter. Bring the butter, cream, Splenda and vanilla to a boil over medium-high heat; cook and stir for 3 minutes. Remove from the heat and gradually whisk in the knox gelatin by lightly sprinkling it over the surface and quickly whisking it in a little at a time. Chill well for several hours or overnight. It should become very thick and stiff.Add the cream cheese and beat with an electric mixer until fluffy. It will change from looking like a very thick pudding to looking just like butter cream frosting. Store your frosted cake in the refrigerator. The frosting will have a buttercream-like consistency as long as it’s kept cold. Spread the icing on the cake and then make the following topping for it. You can find the original recipe for this here. I made a change to it to make it taste sweeter and have less of an aftertaste. Place the coconut in a small bowl. Mix the sweetener with the boiling water then pour over the coconut and mix well. Cover bowl with plastic wrap and let stand 15 minutes. This will turn dry, unsweetened coconut into the soft, sweet kind you buy in the grocery store. It can be toasted by spreading on a baking sheet and bake at 350º for a few minutes, stirring occasionally and watching very closely. Top the cake with this mixture. 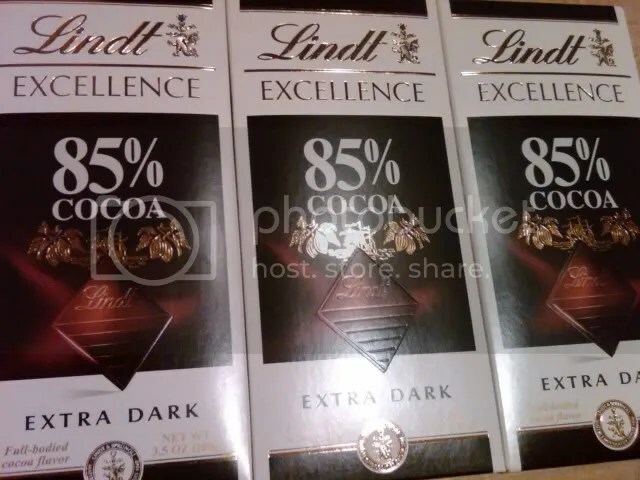 Place 8 squares of Lindt Excellence 85% cocoa chocolate in a microwave safe bowl. Zap for 8 seconds and stir. Keep repeating until chocolate is melted. Drizzle over edges and top of cake. 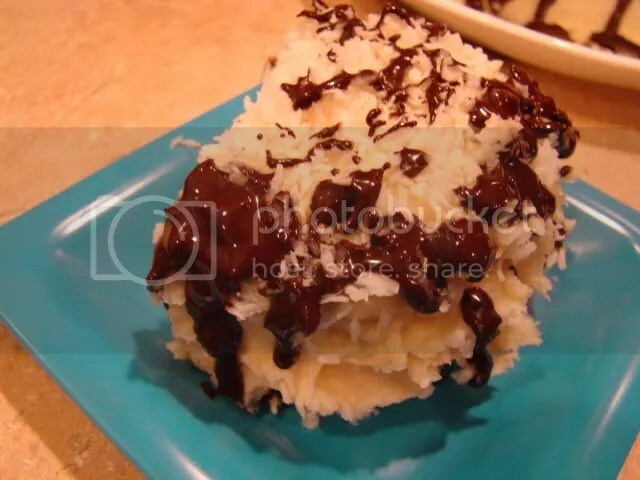 This entry was posted in Desserts, Low Carb/Diabetes, Recipes and tagged Coconut Cake with Buttercream Icing, diabetic recipe, low carb recipe. Bookmark the permalink. Oh, BOY, does this cake look amazing. I can absolutely imagine myself making twice the frosting just to have a spoonful of it when I’m feeling the sugar cravings. Thanks for sharing your photos! I buy the exact same chocolate bars, and I love them. That drizzle is making my mouth water. Thank you very much and welcome to the blog.